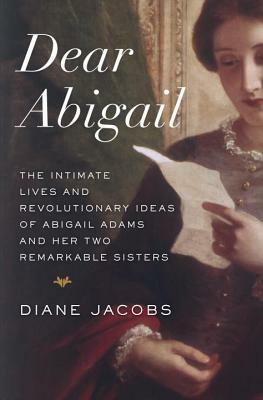 For readers of the historical works of Robert K. Massie, David McCulough, and Alison Weir comes the first biography on the life of Abigail Adams and her sisters. Much has been written about the enduring marriage of President John Adams and his wife, Abigail. But few know of the equally strong bond Abigail shared with her sisters, Mary Cranch and Elizabeth Shaw Peabody, accomplished women in their own right. Now acclaimed biographer Diane Jacobs reveals their moving story, which unfolds against the stunning backdrop of America in its transformative colonial years. Abigail, Mary, and Elizabeth Smith grew up in Weymouth, Massachusetts, the close-knit daughters of a minister and his wife. When the sisters moved away from one another, they relied on near-constant letters—from what John Adams called their “elegant pen”—to buoy them through pregnancies, illnesses, grief, political upheaval, and, for Abigail, life in the White House. Infusing her writing with rich historical perspective and detail, Jacobs offers fascinating insight into these progressive women’s lives: oldest sister Mary, who became de facto mayor of her small village; youngest sister Betsy, an aspiring writer who, along with her husband, founded the second coeducational school in the United States; and middle child Abigail, who years before becoming First Lady ran the family farm while her husband served in the Continental Congress, first in Philadelphia, and was then sent to France and England, where she joined him at last. This engaging narrative traces the sisters’ lives from their childhood sibling rivalries to their eyewitness roles during the American Revolution and their adulthood as outspoken wives and mothers. They were women ahead of their time who believed in intellectual and educational equality between the sexes. Drawing from newly discovered correspondence, never-before-published diaries, and archival research, Dear Abigail is a fascinating front-row seat to history—and to the lives of three exceptional women who were influential during a time when our nation’s democracy was just taking hold. Diane Jacobs is the author of Her Own Woman: The Life of Mary Wollstonecraft, Christmas in July: The Life and Art of Preston Sturges, But We Need the Eggs: The Magic of Woody Allen, and Hollywood Renaissance: The New Generation of Filmmakers and Their Works. She has a BA from the University of Pennsylvania and an MFA from Columbia University. Jacobs has taught at Dartmouth College, the Columbia University School of the Arts, and the NYU School of Continuing and Professional Studies, and has contributed to such publications as The New York Times and The Village Voice. She lives in New York City. “To turn the pages of this beautifully written biography is to step into the shoes of the three Smith sisters in a brilliant reconstruction of their lives against the backdrop of American history. Their triumphs and sorrows remain with you long after you’ve finished reading.”—Marion Meade, author of Dorothy Parker: What Fresh Hell Is This?